The Tissot Chemin des Tourelles Chronograph is the sort of watch Tissot excel at – clean style, quality construction and competitive price. 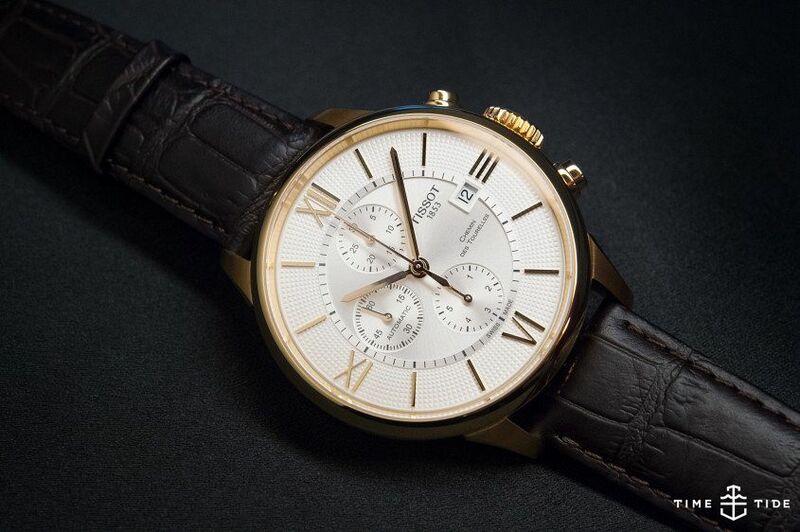 Tissot as a brand is perhaps most famous in the modern day for their sporty and functional T-touch series. It may surprise some to discover that the brand has a long history of making classic chronographs. The Tissot Chemin des Tourelles collection is a direct link to this lineage, the ‘Chemin des Tourelles’ being the name of the street where the Tissot manufacture was built back in 1907 – and where it still is, some 105 years later. 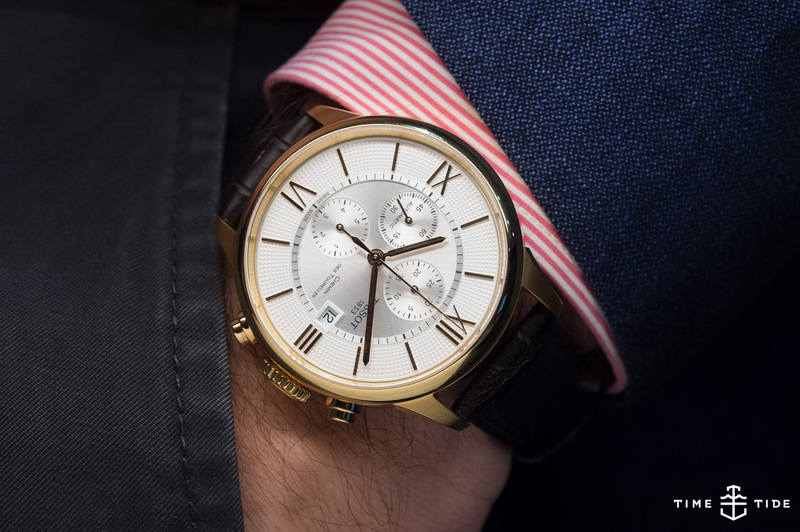 The Chemin de Tourelles is an interesting mix of classic and contemporary – the sizing is definitely contemporary, the modular chronograph movement adds significant height to the rose gold PVD case, but the dial, with its applied roman numerals and excellently circular clous de Paris (kind of a hobnail pattern) chapter ring (which really elevates the look of this watch), surrounding the dial centre and chronograph subdials is very much on the traditional side of the fence. The watch is comfortable to wear, with padded leather strap and deployant strap – large but not uncomfortably so. Tissot has always offered a very strong value proposition for this sort of everyday dress watch, one of the benefits of being part of the Swatch group is the ability to offer movements, components and finishing at a very competitive price point. The Chemin des Tourelles Chronograph is a perfect example. Sapphire crystal, ETA movement, and quality fnishing. The only issue you could really have with this watch is that because it is made to appeal to a large audience it lacks a lacks the individuality or quirkiness of some of their competitors (the Baume & Mercier Capeland comes to mind) – it’s a very safe choice. But for a lot of people, looking for a versatile, good looking and reliable watch the Chemin des Tourelles will tick all the boxes and do so with aplomb.